Who’s ready for some Summerfest? The festival’s still a few weeks away, but we thought we’d start getting you into the Summerfest 2014 spirit by revealing this year’s t-shirt design. 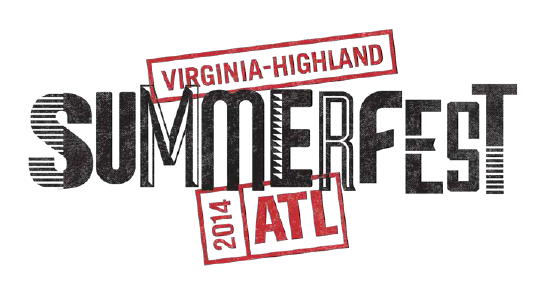 Summerfest committee member Suzanne Scully spent the past few months working with our partner Porchlight to create this year’s design which features a stylized version of the festival name, accented with a ‘stamp’ or ‘stencil’ of the neighborhood’s name, the year and the letters ATL. A version of the design shown here will be used on the volunteer and staff t-shirts, while different versions of the same design will be used on the Road Race, Tot Trot and ‘for purchase’ men’s and ladies’ shirts. What do you think? We hope you’re as pleased with this year’s design as we are and we hope to see everyone at Summerfest in June! This entry was posted in news and tagged 2014, summerfest, tshirt by John Becker. Bookmark the permalink.